The film is a sort of commercial itself, or rather commercial within commercial, but it is also a satire of how jazz was enslaved by consumerist culture when demands of the market limited this music in terms of what could be played and how that should be played. If most of great jazz performances on film suffer from interruptions and intervention with songs, A Date With Dizzy shares the same symptoms, yet intelligently makes fun of it. Relying on a very simple, long-take-filmed-in-medium-shot style, this comic short is a mixture of historical documentation (seeing Dizz and Sahib together is a precious moment) and sheer nonsense. 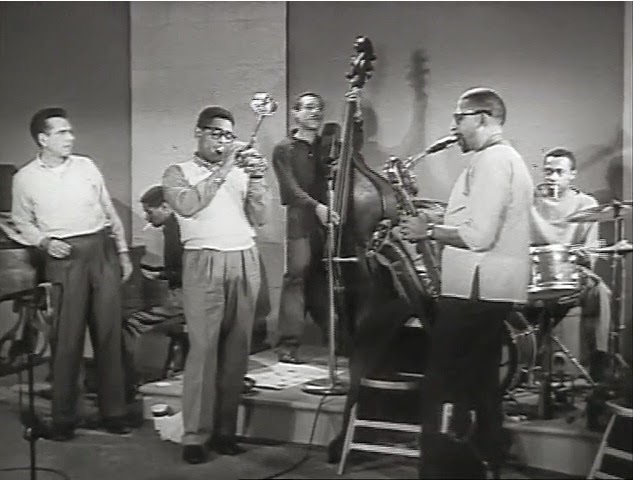 The ignorance towards jazz as an artistic form is somehow attached to most of the films we see from that period (or even today), A Date With Dizzy included, where Sahib Shihab, a great baritone sax player, is credited for alto sax! I have re-embedded the video. Now you can see for yourself.